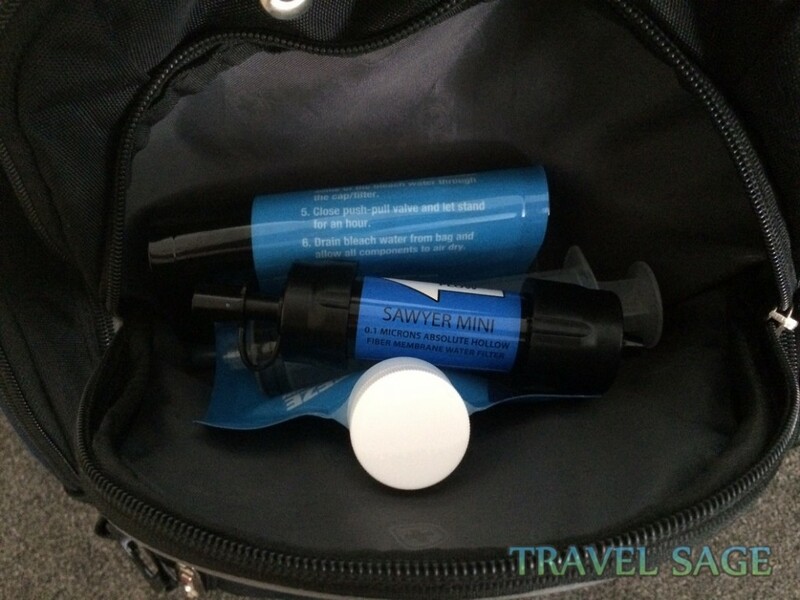 The Sawyer Mini Water Filter System Review | Best Travel Water Filter? Sawyer water filters are quite popular particularly the Sawyer PointOne filter so they decided to make a travel friendly one. 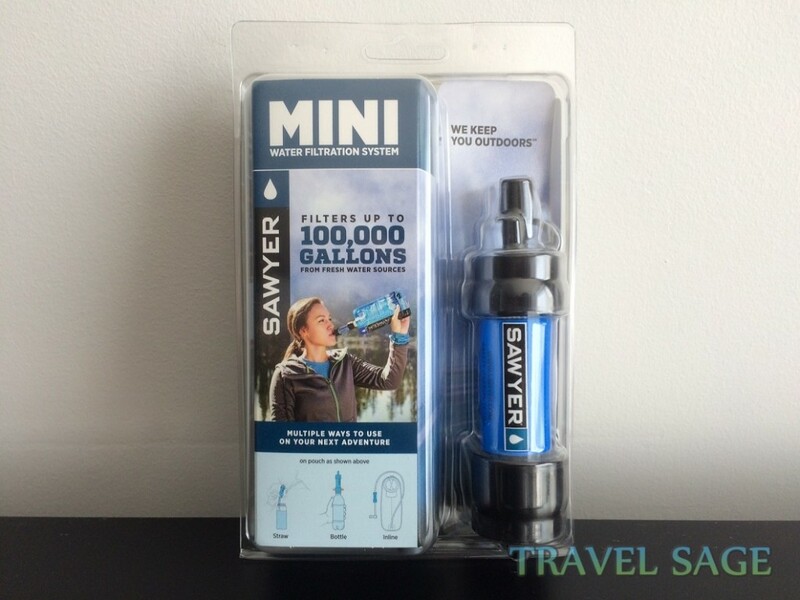 Made with advanced revolutionary filter technology, the Sawyer Mini Water Filtration System is one of the best travel water filters with the fastest flow rates in filtering out contaminated water. This portable water filter system provides ‘a lifetime of water at hand’ in a variety of ways. But how convenient is it to carry this around? And what makes it different to other handheld water filters? Read on to find out. 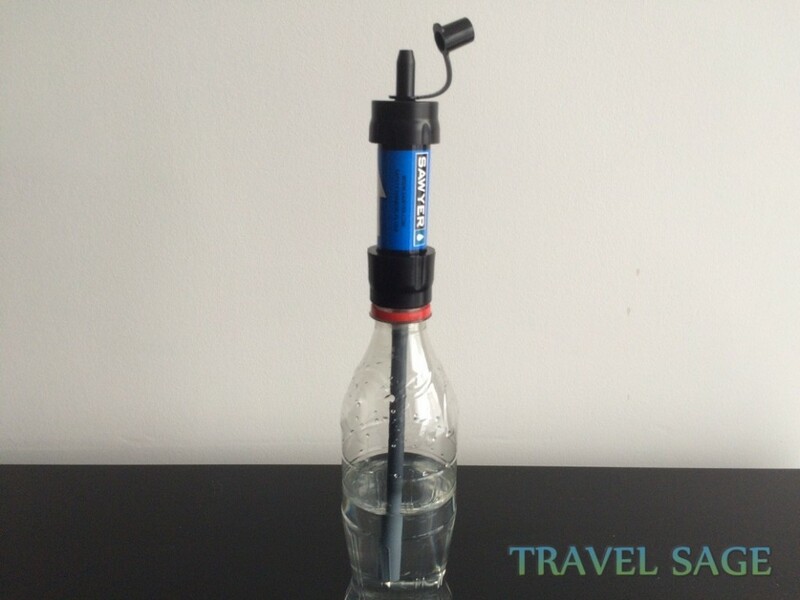 Why Use a Travel Water Filter? A good water filter will provide us with safer water to drink from taps at home but a travel filter will provide us with drinkable water from a number of sources including mountain water, muddy puddles, lakes or streams. What’s So Good About the Sawyer Water Filter? Absolute Micron Filter Technology: A cluster of micro-fibrous tubes lives within the filter which is rated to 0.1 micron meaning no hole is larger than this size. This enables a high water flow rate which reduces the risk of drinking contaminated water as it’s harder for bacteria to get through. 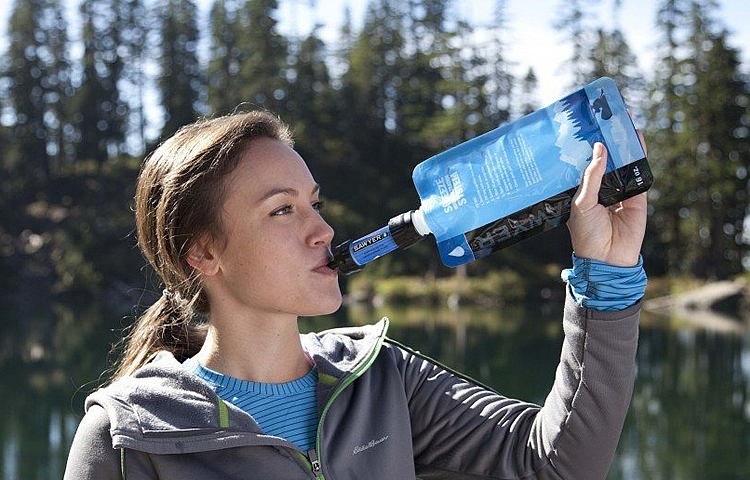 Versatile: It can be used to drink directly from the water source with the straw, screwed onto bottles, used with the squeeze pouch or attached to an inline hydration pack. No Expensive Cartridges To Be Replaced: By backwashing the filter after use, it can be reused over and over again. This cleaning method restores the flow rate up to 98.5% and ensures the life of the filter to last longer. Small & Lightweight: Weighing only 2 ounces, you won’t even feel the weight of it in your bag. Being only 14x4cm in size, it fits into the palm of your hand. How Does the Sawyer Mini Water Filtration System Work? 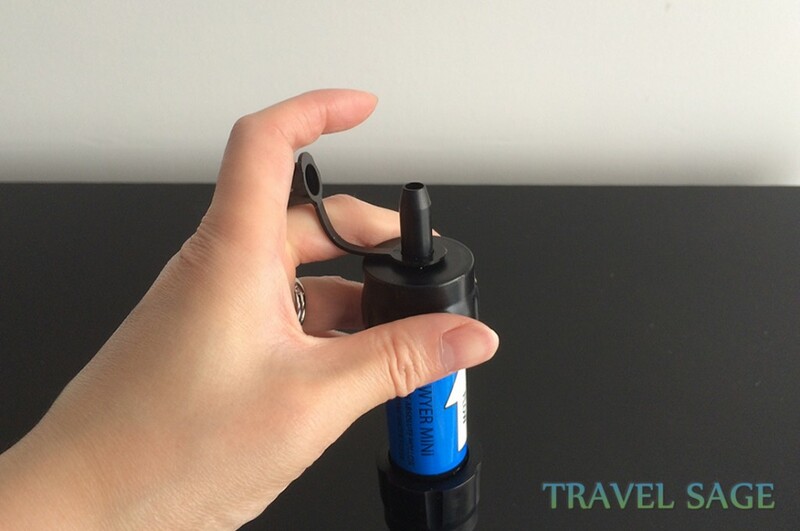 Looking at this travel water filter, it looks like a tiny dumbbell or some sort of battery. This hollow plastic tube that houses the filter inside feels very light in my hand. One end has a capped mouthpiece and the other end has a nozzle with a screw ring. Overall, it feels tough and durable. As each micron is 0.1 in size, a high percentage of bacteria, protozoa and cysts will not be able to pass through. 99.9999% to be precise. Our chances of catching illnesses such as E.Coli, cryptosporidium and salmonella are greatly reduced. When you drink, the water flows through the sides of the wall in the tube. The outer wall is where the harmful bacteria and others are trapped. However, minerals, salt from seawater, individual viruses and chemicals cannot be filtered out. So, don’t drink seawater and in waters where chemicals may be present! With the drinking straw provided, this enables you to drink water from its source or from a container. It simply plugs to the nozzle at the bottom of the Sawyer water filter system. The straw is little small for the nozzle and I had to push it hard for it fit in. However, it did loosen quite often so it fell out in the container I was drinking from. Avoid sticking the travel filter in freezing cold water as well because a few people mentioned doing this caused the filter to expand and crack. As a result, this rendered the filter useless. This can also happen in cold weather so it would be better to keep the filter on your body to keep it warm. The plastic pouch provided is flexible as it can be rolled or folded up for easy storage. There’s a plastic screw on cap to keep the pouch sealed when it’s not in use. It’s best to squeeze water from the pouch gently otherwise too much pressure can cause the pouch to split which some people discovered. I did find the hole for the pouch a bit small though and it took a while to fill the pouch due to the amount of water I spilled. To make filling the pouch up easier as well, it works best if you inflate the pouch first. 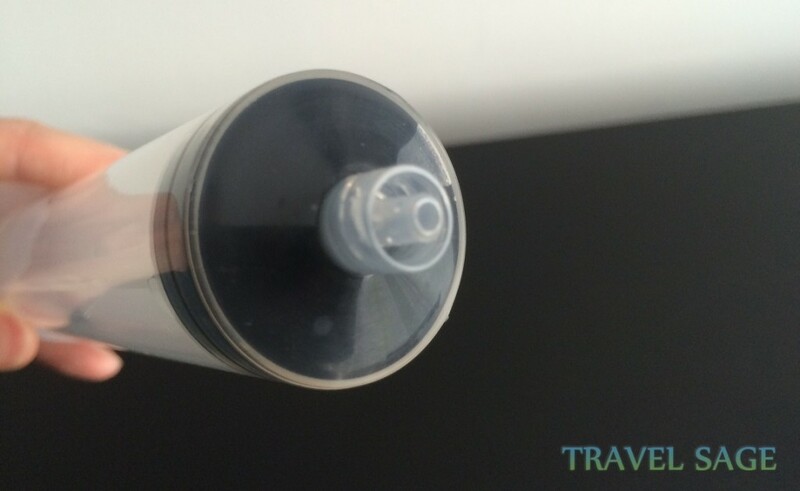 Underneath the travel water filter is a rubber ring attached which prevents leaks as well as damage to the plastic when it’s screwed onto a bottle or the pouch. However, screwing the filter onto anything too tightly will cause leakage. The filter can screw onto most standard plastic bottles but not all personal bottles. I used it with a coke bottle but I couldn’t use it with my personal one as the screw bit was too low on the bottle. There’s no extra attachments needed to use the water filter with an inline water reservoir. The nozzle at the bottom of the filter acts as the connector. 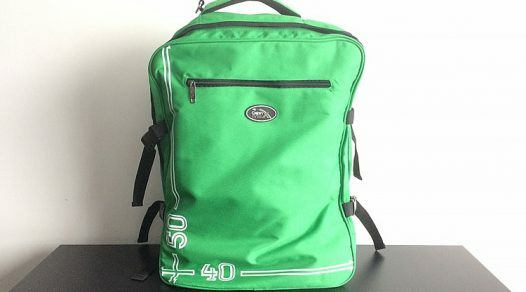 Many people have said this was easy to fit in and can be used with most hydration packs. By backwashing the travel water filter regularly, the filter will be cleared of any blockages and cleaned. If this isn’t done, it will only make sucking up water harder and the water flow will be poor as well. The plunger is basically a syringe which you need to fill with clean water and then fit it to the nozzle on the bottom of the Sawyer water filter. It should be facing against the ‘flow’ arrow on the filter. Then with the mouthpiece of the filter open, push the plunger down so water squirts from the mouthpiece. With Sawyer’s award winning travel water filter system being one of the world’s most popular lightest and smallest, there’s bound to be competitors. 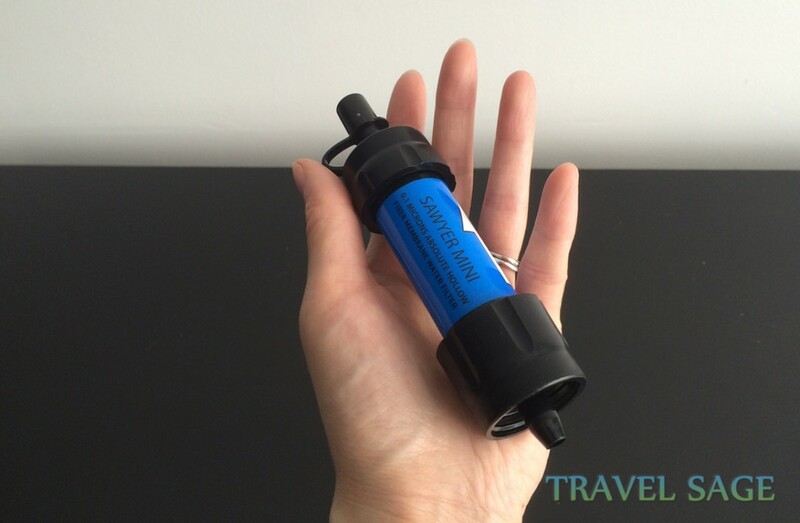 Another award winning travel filter is the LifeStraw Personal Water Filter which is widely used around the world. Neither can filter out chemicals, viruses or salt water. Neither can be frozen because it can damage the membrane and filter. Both are used by many people as a survival water filter! Is There A Big Difference In Usage? Amount of water filtered: Sawyer filters up to 100,000 gallons (about 378,000 litres) whereas the Lifestraw filters at least 1000 litres only. It’s clear to see which one will last longer. Longer lifespan: Sawyer’s Mini Water Filter System can be backwashed to extend its lifespan and save costs, whereas the Lifestraw stops filtering after going through its 1000 litre limit and has to be replaced. Micron sizes: There’s a very slight difference in the percentage of bacteria and protozoa filtered out for each water filter due to the micron size. 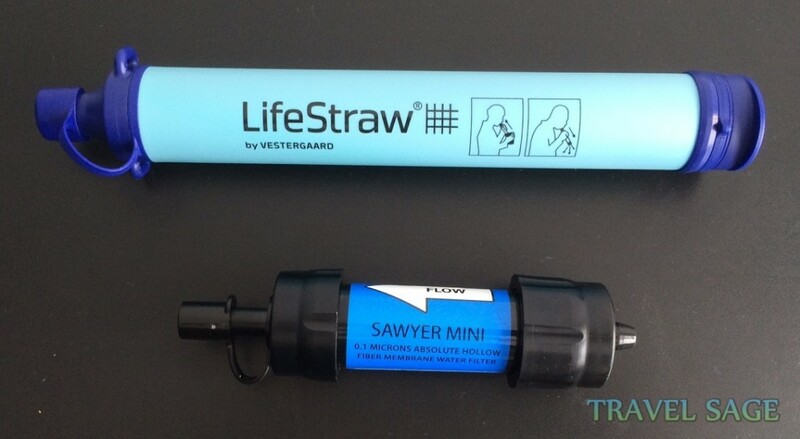 The Sawyer mini filter is 0.1 micron size but the Lifestraw’s is slightly bigger at 0.2 which means more bacteria can get in. Warranty: A limited lifetime warranty is provided from Sawyer but I couldn’t find much information about the warranty for the straw filter other than to contact the manufacturers about it. 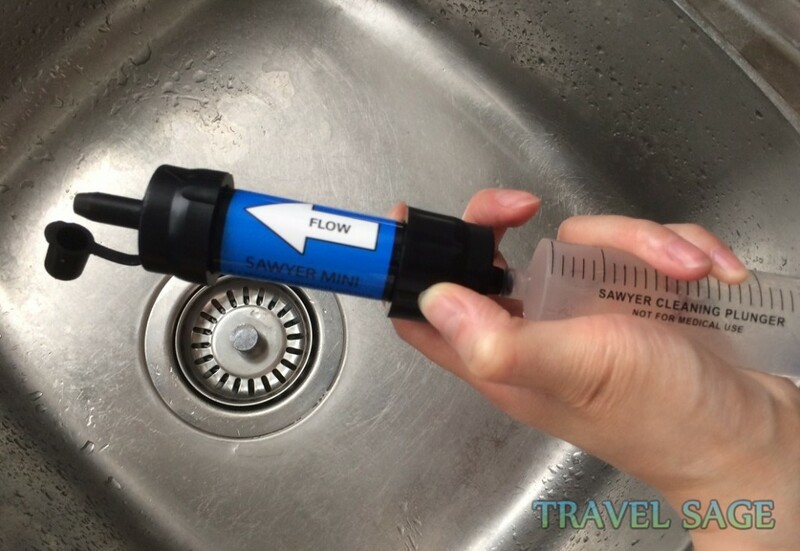 Cleaning: By using the syringe to clean the Sawyer water filter, this ensures a more thorough clean as water is forcefully pushed through the filter. 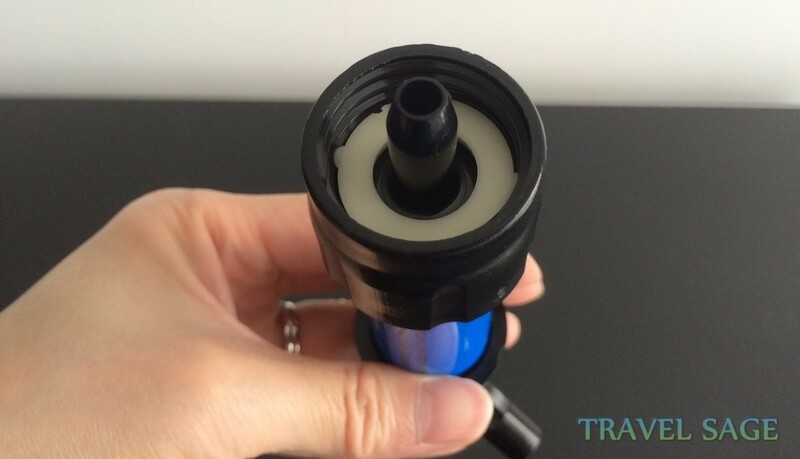 LifeStraw filter’s cleaning method is just blowing into the mouthpiece which may not be strong enough from some people. I’m not much of an outdoorsy person but having one of these on hand is pretty useful because I use it on most of my trips. I can’t always be buying bottled water and complimentary bottled water is often limited in hotels so having this water filter allows me to drink tap water safely. 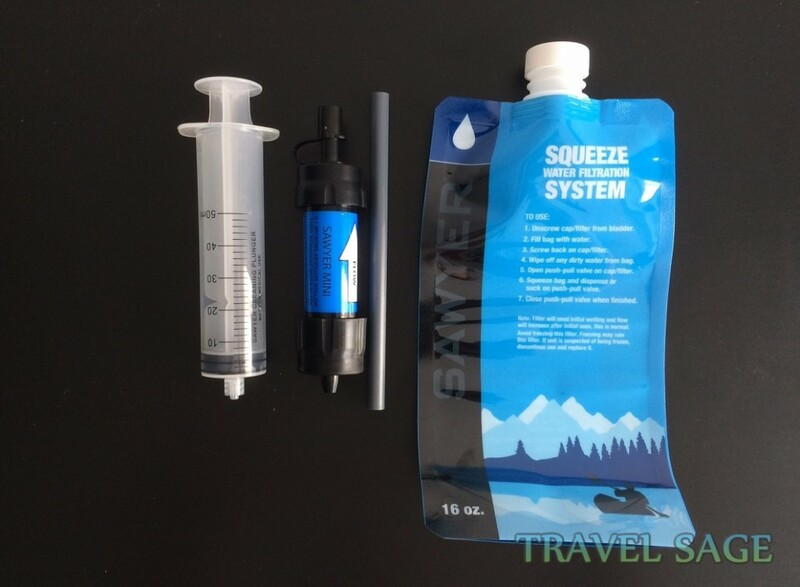 This handheld water filter system on its own barely takes up any space but don’t forget, you have to account for the drinking straw, plunger and the squeezable pouch too. I often have to keep a pocket free in my bag for all four items. It’s a bit of a hassle to use the plunger as it doesn’t stay on the filter well when I push the plunger down. As a result, I can’t put much force into clearing the filter. I wonder why the syringe end is shaped like it can be screwed onto something then? It would have been easier to use if it could be screwed onto the nozzle end of the filter. The Sawyer Mini water Filtration System proves to be one of the lightest and smallest portable water filters around. 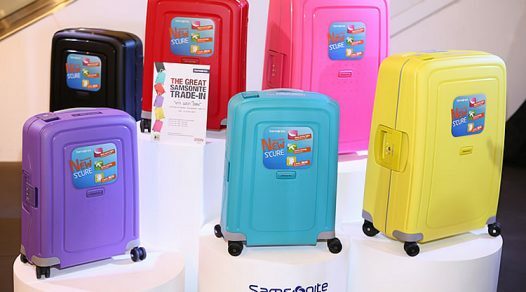 It’s ideal for outdoor activities, travel to countries with questionable water or just home use. 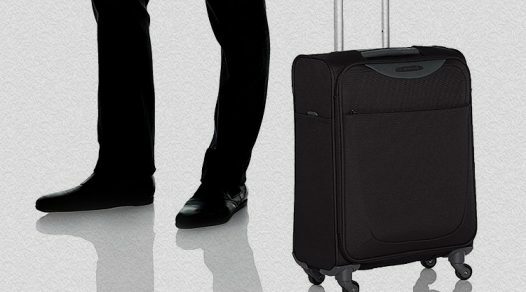 It beats carrying big filters or bottles of water on those hiking or camping trips. 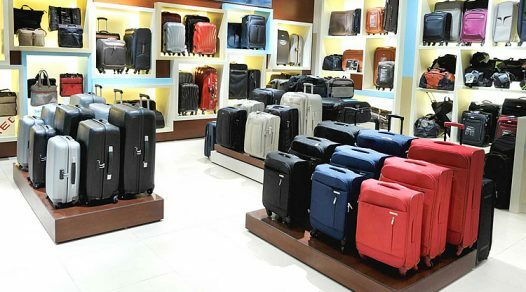 Compared to other brands, this one has a lot more versatility to it. It’s a reasonable price for a travel water filter because it’s going to last so many years since it can filter up to 100,000 gallons of water. Its slogan, ‘a lifetime of water’, is true in this case.